New and only offered at Southwest Disk - This is the largest disc available at 24 inches! This brand new discada/disco cooking disc features your choice of handles - Angel Fire (1/2" Circle), Santa Fe (Horse Shoes), BBQ Springer (Springs) or the Trinity (1/2" Oval) handles. We named this one after the mighty Rio Grande River. Cones up to a height of 4"
Gives you 27" of cooking space end to end...this will hold a lot of food!! The Mighty Rio Grande - One of the longest rivers of North America. The Rio Grande flows out of the snowcapped Rocky Mountains in Colorado and journeys 1,900 miles to the Gulf of Mexico. It passes through 800 foot chasms of the Rio Grande Gorge, a wild and remote area of northern New Mexico. The canyon provides a wide variety of recreational opportunities, luring fishermen, hikers, artists, and whitewater boating enthusiasts. Access in the upper canyon is restricted by the terrain, but several trails lead to the rivers edge. The two most popular whitewater segments are the Taos Box, 17 miles of Class IV whitewater, and the 5 mile Racecourse, a Class III segment. The lower canyon is paralleled by state roads, and receives the majority of the recreational use. The Rio Grande and Red River designation was among the original eight rivers designated by Congress as Wild and Scenic in 1968. The designation was extended by legislation in 1994 to include an additional 12 miles of the Rio Grande. The designated area includes 60 miles of the Rio Grande from the Colorado/New Mexico state line to just beyond BLM's County Line Recreation Site, and the lower 4 miles of the Red River. 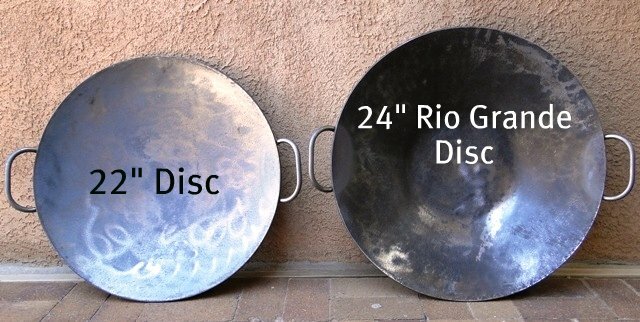 Having a 36" Blackstone, i purchased the 24" Rio Grande for quick, smaller cooking projects. Works great with shrimp, steaks, peppers and onions and a outstanding job on fajitas. Clean up is easy, only thing i wish was available would be a rubber cover to lay over it to help with oxidation when it is not in use. It is seasoned properly and oil down after use, but it will start to show a few areas, a rubber cover to lay on the disk to seal it would solve the problem. I just go my discada and have used it a few times already. This thing really is a great way to cook so many different things in the outdoor. I am going to put this to use cooking for our Boy Scout Troop since this is so good at cooking for a large number of people at a time. I definitely recommend this.